Shoulder impingement syndrome is the most common musculoskeletal diagnosis related to shoulder injuries. There has been an ongoing debate on the etiology of impingement and rotator cuff tears, but it is likely to be multifactorial(4). Impingement indicates that there is a narrowed space underneath the acromion (see diagram 1). Structures that may be involved in this diagnosis include the rotator cuff tendons, bicep tendon, subacromial bursa, and the coracoacromial ligament. Sometimes bone spurs develop within this space and cause inflammation to these structures, however other times there may be evidence of degenerative “wear and tear” of the rotator cuff tendon that is causing the pain. The shoulder is a multidirectional joint and therefore the assessment of the joint capsule, scapular movement patterns, and shoulder muscles should be performed to determine the extent to each individual injury. A clinical examination and movement-based assessment should be used to determine the reason for underlying pain and inflammation. If inflammation exists within the subacromial space, the mechanics of the shoulder brakes down causing pain and movement dysfunction. This will typically result in anterolateral arm pain. Common exacerbating movements include laying on the affected side, stretching and reaching for overhead objects. 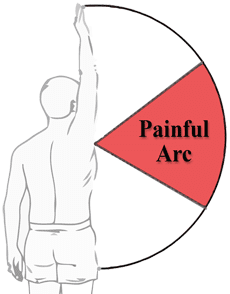 A painful arc will be present when raising the arm between 60 and 120 degrees. More than likely you will have involvement of the rotator cuff tendons. 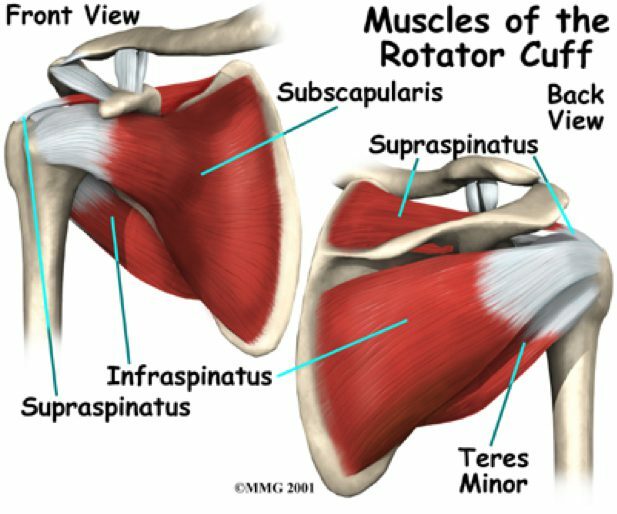 There are 4 muscles part of the rotator cuff: supraspinatus, infraspinatus, teres minor, and subscapularis. These muscles are responsible for stabilizing and gliding the shoulder properly when you move and raise your arm away from your body. The most common rotator cuff muscle involved is the supraspinatus since it travels directly under the acromion. Pain, inflammation, and weakness at any of these muscles will decrease the ability to raise your arm overhead. Research indicates that conservative treatment methods are the most effective if you do not have a full thickness tear of the rotator cuff. Physical therapy is a critical component to your recovery of shoulder impingement and rotator cuff tendon injuries. Supervised exercise that includes range of motion activities, stretching, and strengthening is imperative in the rehabilitation process (2). Research also indicates that manual therapy in addition to exercise is better than just exercise alone (1). This may include joint mobilization to address the joint capsule as well as soft tissue mobilization techniques to address pain and muscular dysfunction. There is also research to support the use of cervical and thoracic manipulation to reduce pain and improve range of motion through the shoulder(5). All of our therapists are well trained in these manual techniques. Corticosteroids are also commonly used as an avenue for conservative treatment by physicians. However, research indicates that these patients require additional doctors visits and multiple steroid injections as compared to those patients who receive physical therapy alone (3). Many times patients that receive injections require physical therapy additionally anyways. Surgical intervention is not recommended unless there is a large rotator cuff tear and is most always the last resort as a treatment option. Physical therapy should be the initial step to treating shoulder impingement and rotator cuff pathology. This ultimately allows for reduced healthcare costs and provides a conservative effective avenue for returning patients to their daily activities without pain. Direct access allows for many patients to come directly to physical therapy without a physician referral to evaluate and treat a musculoskeletal dysfunction. If you have a pain in your shoulder, please call Hampton Physical Therapy with clinics in both Hampton, NH and Seabrook, NH to schedule a comprehensive assessment! 1. Bang, MD, et al. Comparison of Supervised Exercise With and Without Manual Physical Therapy for Patients With Shoulder Impingement Syndrome. J Orthop Sports Phys Ther 2000;30:126–137. 2. Halk, MN, et al. Effectiveness of physical therapy treatment of clearly defined subacromial pain: a systematic review of randomised controlled trials. Br J Sports Med. 2016 Sep;50(18):1124-34. 3. Rhon, DI, et al. One-Year Outcome of Subacromial Corticosteroid Injection Compared With Manual Physical Therapy for the Management of the Unilateral Shoulder Impingement Syndrome: A Pragmatic Randomized Trial. Ann Intern Med. 2014;161(3):161-169. 4. Singh, B, et al. Current Concepts in the Diagnosis and Treatment of Shoulder Impingement. Indian J Orthop. 2017 Sep-Oct; 51(5): 516–523. 5. Vinuesa-Montoya, S, et al. A Preliminary Randomized Clinical Trial on the Effect of Cervicothoracic Manipulation Plus Supervised Exercises vs a Home Exercise Program for the Treatment of Shoulder Impingement. J Chiropr Med. 2017 Jun;16(2):85-93.